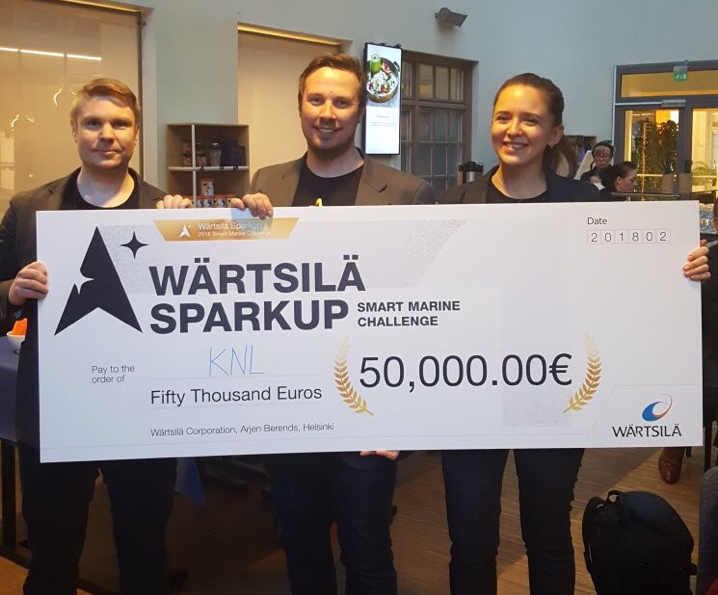 Last night it was announced that KNL Networks was one of the first two winners of Wärtsilä’s SparkUp Challenge, an initiative by the maritime industry specialist to find innovative startups and to develop ideas for the smart shipping value chain. Out of 150 applicants, 11 startups made the shortlist to pitch and answer questions at the Wärtsilä Ventures event in Helsinki. Starting in March, the KNL Networks team will collaborate over four months at the Wärtsilä Digital Acceleration Center and will receive a capital grant of €50,000. KNL will be joined by Portcall.com, a collaboration platform that logs incoming and outgoing ships in ports, and optimises port operations. “I think KNL has giant potential, and what I like most about their solution is that they have their own hardware from point to point, as well as their own cyber security, so nothing needs to be done over the internet,” says Jörgen Strandberg, member of the jury and General Manager Advanced Technology in Wärtsilä Marine Solutions in Wärtsilä’s statement. “Both winning start-up companies are perfectly positioned to deliver our smart marine vision. This start-up collaboration will accelerate our business and help to create new value for our customers. I see it as being a strategically important step for Wärtsilä,” said Saku Mäihäniemi, member of the jury and Head of Digital of Wärtsilä Services.